Facebook’s Mark Zuckerberg believes he is the one to “cleanse” the internet of anything he deems to be offensive, politically incorrect, an attack or something vulgar (but he has his own standards in which he allows things that are just that against others). While many people do not use social media platforms like Facebook for a variety of reasons, mostly privacy, the fact is that millions of people do use it for business, keeping up with loved ones, meeting people and news. So, Zuckerberg has decided to tighten the noose, if you will, on newsfeed. No, not trusted by the community. Trusted by the Nazi censors at Facebook. As with anything at Facebook, it only takes a couple of people reporting you for something that is perfectly legitimate to be posted. Does anyone think that Facebook really has an idea of whether people are familiar with a source or not? I mean they will simply be checking a box, right? If you weren’t already not getting feeds from your friends and pages that you liked, but rather pages that paid Facebook to show you what you weren’t interested in in the first place, it’s only going to get worse. My goodness, Facebook can’t even get fact checkers that are unbiased! Do you really think they are going to provide a fair outlet so that you don’t get anything but what the CIA-controlled media is presenting you? If you do, I really am sorry that you are not seeing clearly. So, how can you change things to see feeds in your news that you actually want to see? Glad you asked. The Daily Wire has provided some very helpful tips. 1. On your Facebook homepage, click the drop-down arrow on the top right of the page and select “News Feed Preferences” (usually found near the bottom of the listed options). 2. Select “Prioritize who to see first” (usually the first option listed). 3. Change the view options to show “Pages only,” so it’s easier to find the pages for the sites you prefer to see in your newsfeed. 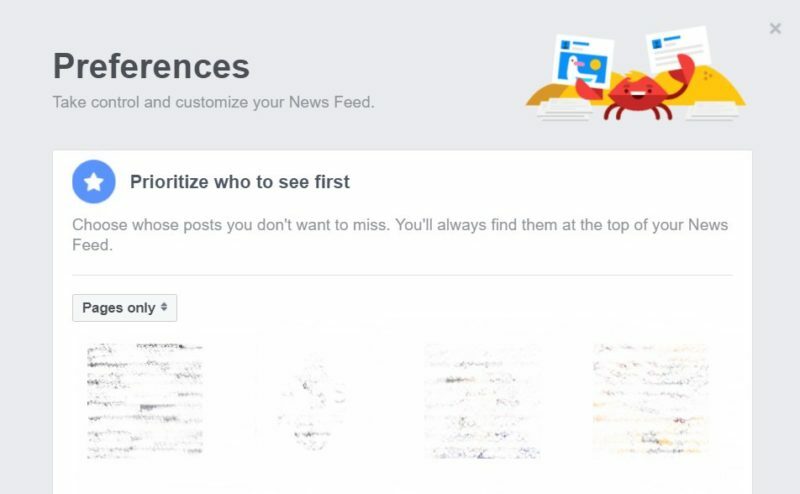 Then simply select the pages you wish to see first in your newsfeed. After you’ve protected your newsfeed to make sure you’re still seeing posts from your favorite sources, the other extremely important thing you can do to make sure those sources don’t get buried by Facebook is share posts with friends and family. Like it or not, social media platforms like Twitter and Facebook, as well as internet search engines like Google are going to be widely used when it comes to elections and news in the future and this continued infringement on the press and free speech by these corporations are going to have massive ramifications for our future if we do not find a way to deal with them. The above steps are only a temporary remedy. I think its high time that we begin to look seriously at using anti-trust laws to break up companies like Facebook, Twitter and Google who are knowingly engaged in censorship of free speech and the press.